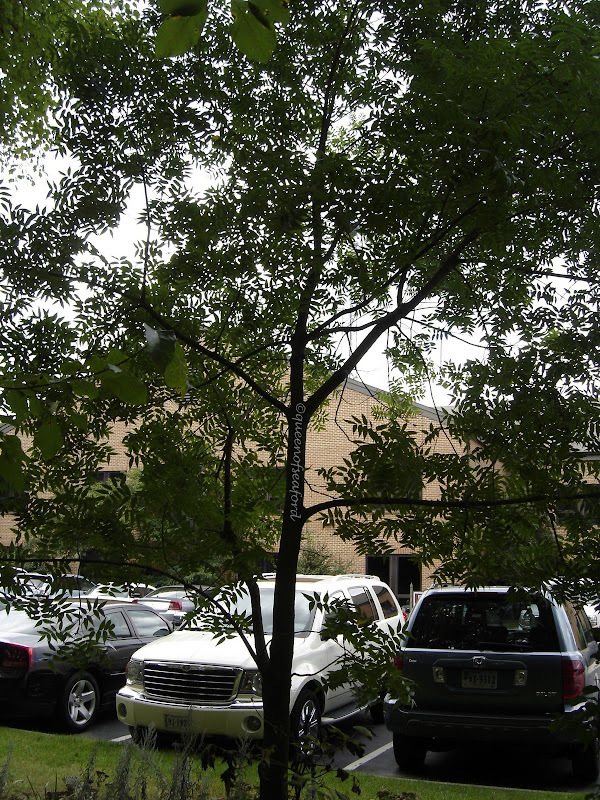 Pistacia chinensis is an outstanding tree that is being used more frequently as a 'street tree'. 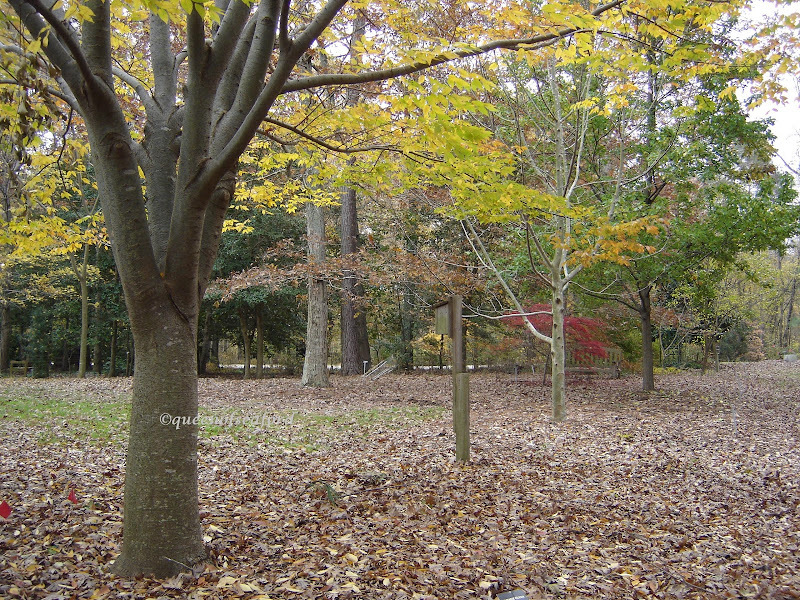 Considered a medium sized tree, average height is somewhere between 25 and 35 feet with a similar spread. It can reach a height of 60 feet, though that is not typical. It is a lovely vase shape tree with large evenly compounded pinnate leaves. 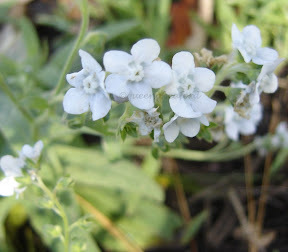 The leaflets are approximately 2 to 4 inches in size. Many of the web sites tell of the gorgeous fall color of red to orange. This puzzled me as our tree in the photographs is from the Learning Garden. My first awareness of our tree was last fall. I was taking pictures for use within the Cooperative Extension Office. The tree didn't have a metal sign and the wooden stake with the name was unreadable. After making the ID for the tree I was still puzzled. 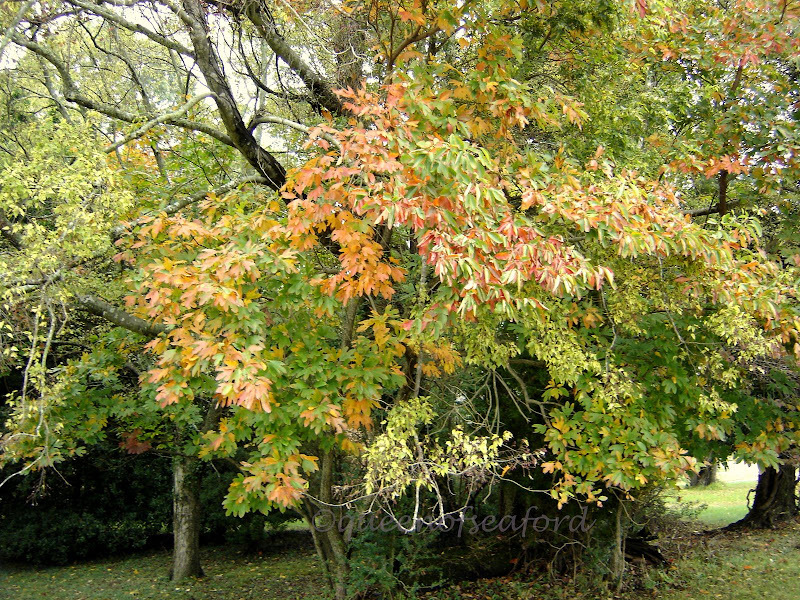 I had an article about tree fall color foliage ---Chinese Pistache was listed as a wonderfully bright red fall color. WHAT?? 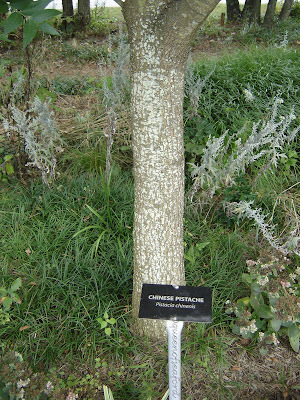 It took a lot more investigation to convince me that is was indeed a Chinese Pistache. I guess you could say I like double documentation. 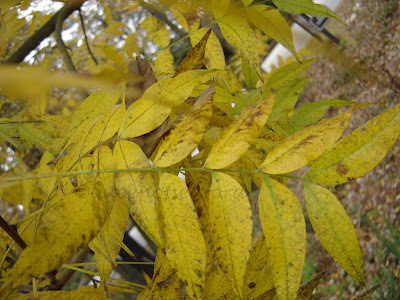 I did find a few references that include yellow as the fall color. It is beautiful in the garden. 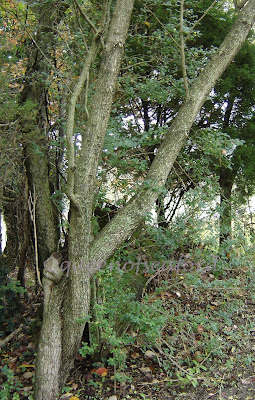 Proper pruning is needed with this tree as the lower branches can droop. The upright vase shape also has V-shaped crotches that need to be managed for strong structural growth. Some reports with my reading say that some have thorns, ours does not. 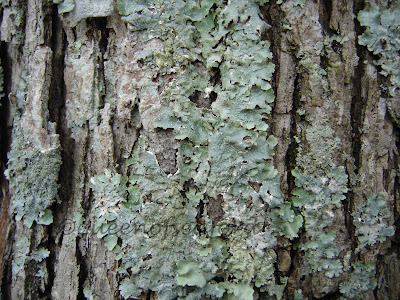 The bark is gray-brown and as it matures will flake off to show a salmon red to orange inner bark. Ours is still a young tree. 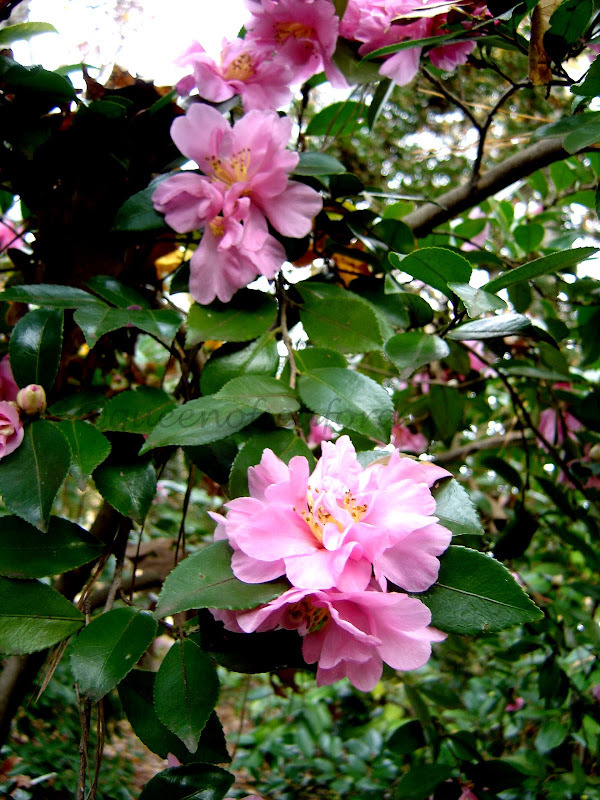 It is a dioecious tree and the flowers have gone unnoticed by me on our specimen. 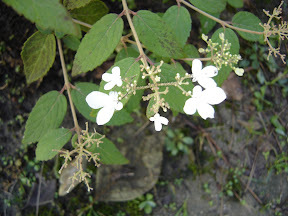 It can spread by seed that because of that there are a few conflicting documents about its invasiveness. 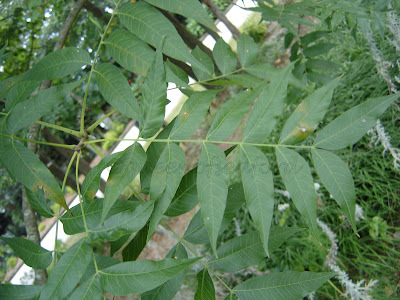 Both documents are from Texas—two claiming it to be a wonderful tree for planting, Texas Superstars (quick overview) and Texas Tree Planting Guide- (advocating this tree for Texas )and against planting it, Austin Growgreen (advocating NOT planting this tree as it is invasive in Central Texas, spreads by seeds). If you live in Texas be sure to check with your Extension office to see what the status is for your county. The zonal range for this tree is pretty wide. 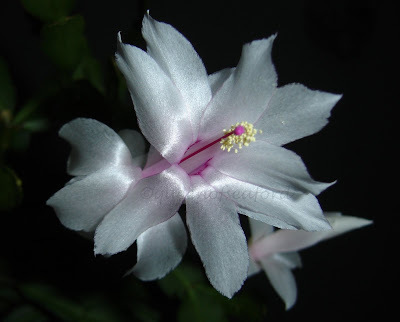 It is hardy from zones 6b- 9. 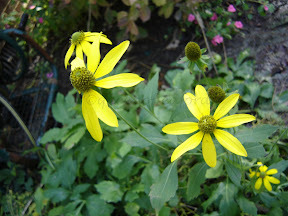 While not a native to the US it has been used in urban areas with less than perfect growing conditions and done well. Virginia Tech- one page reference sheet- my applets for the pictures didn't load, not sure if they will for you. 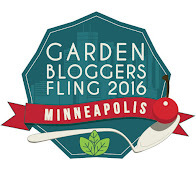 Many of you know of the contest over at Gardening Gone Wild. The theme this month is 'The End of the Line'. I have contemplated which photo would be my best entry. After narrowing the choices down from a bazillion to 6 then to 4 I asked a few family members. 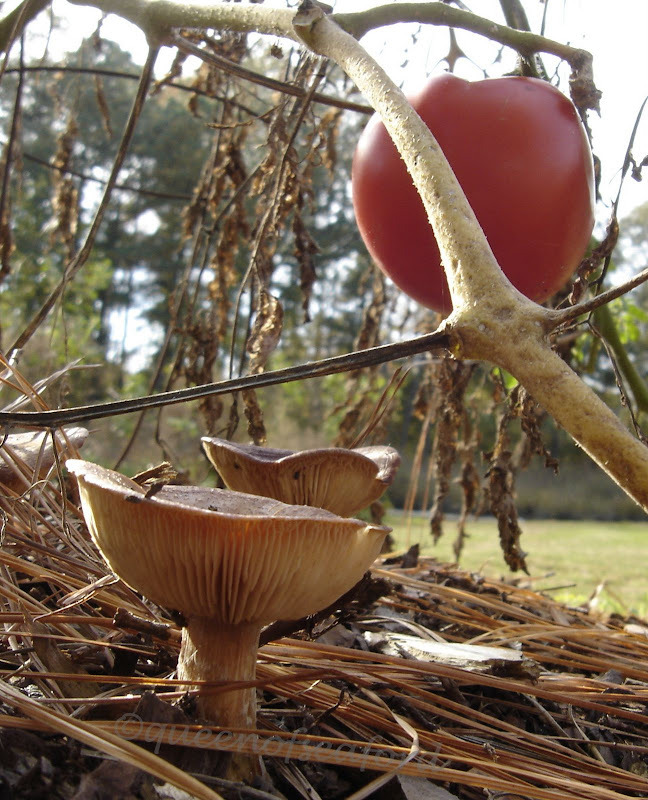 The prefered choice was the one I kept going back to --- a rotten tomato and a mushroom. Isn't compost/decay really the end of the line? I think so too. 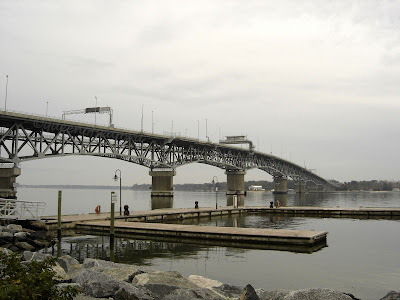 And the last one, the Coleman Bridge. While it is a cool picture, my daughter points out it doesn't lead to the end of the line, just to Gloucester! Yesterday in the Learning Garden there was a lot of cleanup from the storm. Lots of leaves and limbs were down. After most of the raking was done for the day I walked around with my camera. Unfortunately I had some batteries that were on their last bit of power. Before the camera died I was able to get some nice pictures. 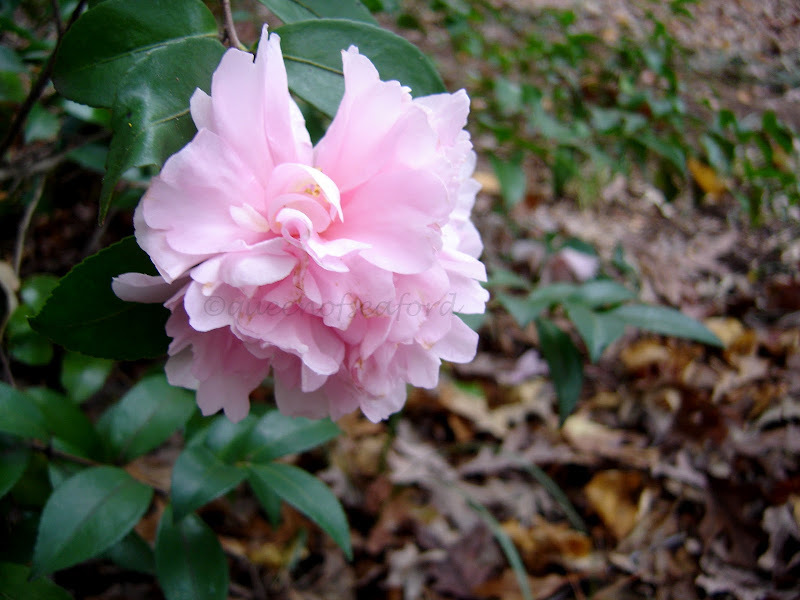 Here is the Camellia that Racquel spoke of. 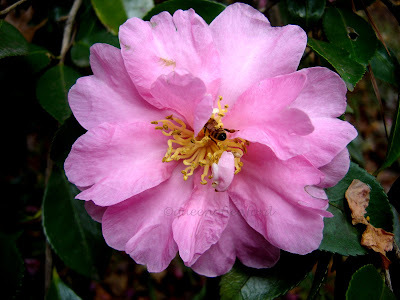 Turns out someone moved a sign and we thought it was Camellia japonica 'Mrs. Charles Cobb', which, if I thought about it I would have realized, too early for a japonica. 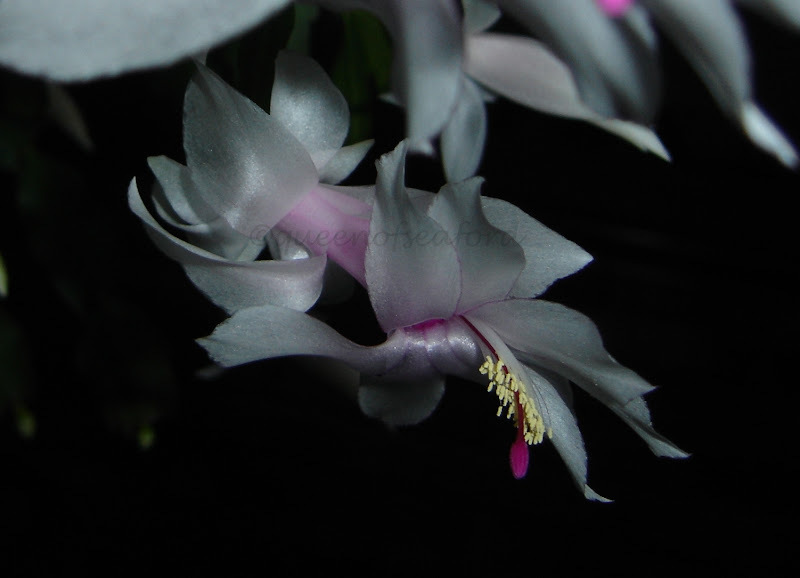 It is an unnamed C. sasanqua at this point. 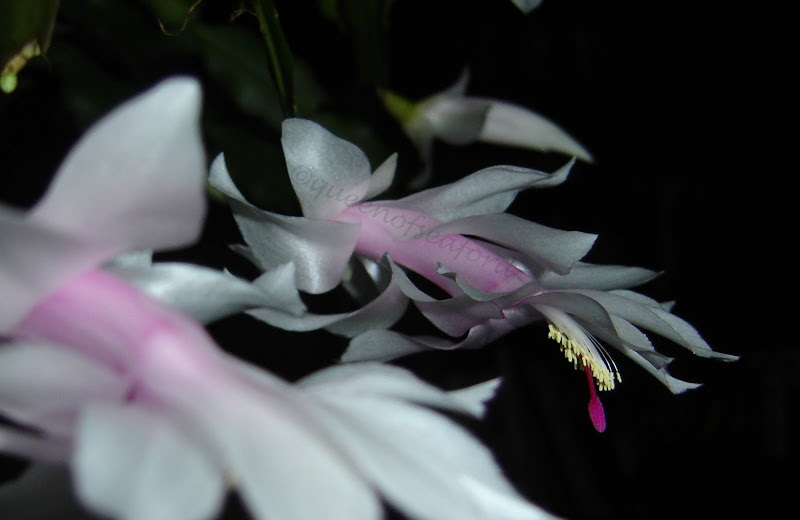 As the bloom matures it turns pink. Both of these pictures are from the same shrub. 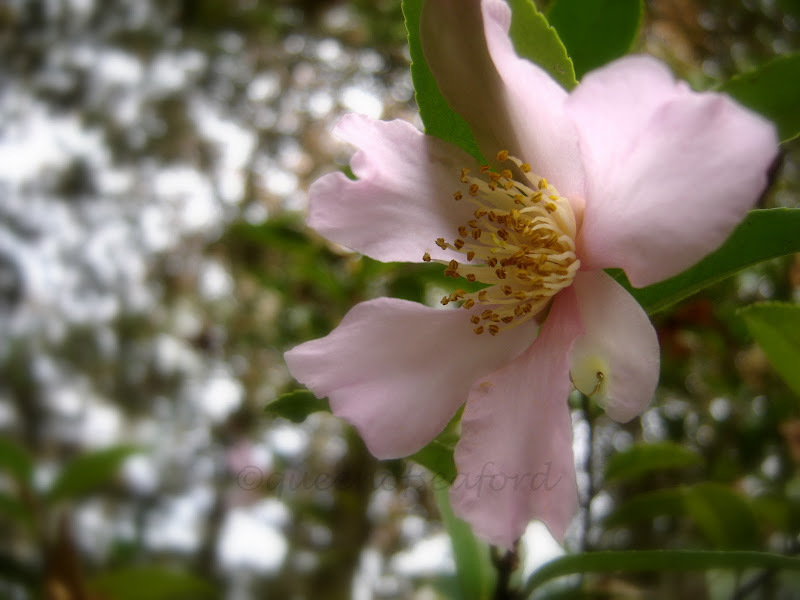 Another unknown pink Camellia that is in bloom now. A grouping of some White Oaks in our picnic area have a lovely array of lichen on them. 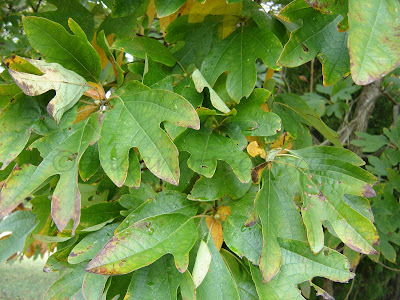 A native tree to most of the states, the Sassafras albidum is very recognizable. The kids always knew the tree by the three different leaf shapes. 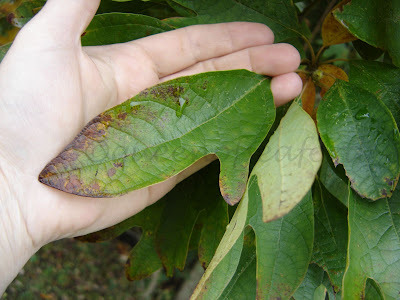 This tree has the oval leaf, a tri-lobed leaf and the one the kids recognized immediately, the mitten leaf. Do you like root beer? The origins of this soda come from the root of this tree. You can smell the root beer flavor by crushing small twigs or roots. Additionally tea can be made from the root. Are you a fan of gumbo? This Cajun dish has an ingredient called filé. 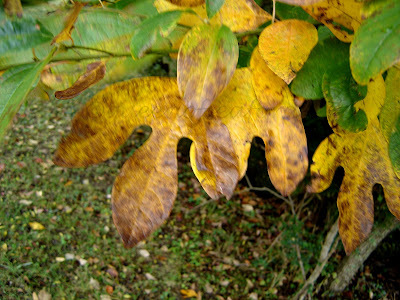 Filé comes from the dried, ground leaves of the sassafras tree. Cherokee, Choctaw and Chippewa have many uses for this tree, from tea to spices flavoring their foods. The Spanish explorers brought the tree back to Europe in the 1500's. 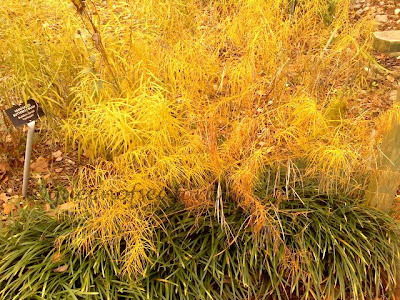 Though this tree has a wide range, zones 4- 9, the tree does better in sunnier locations. 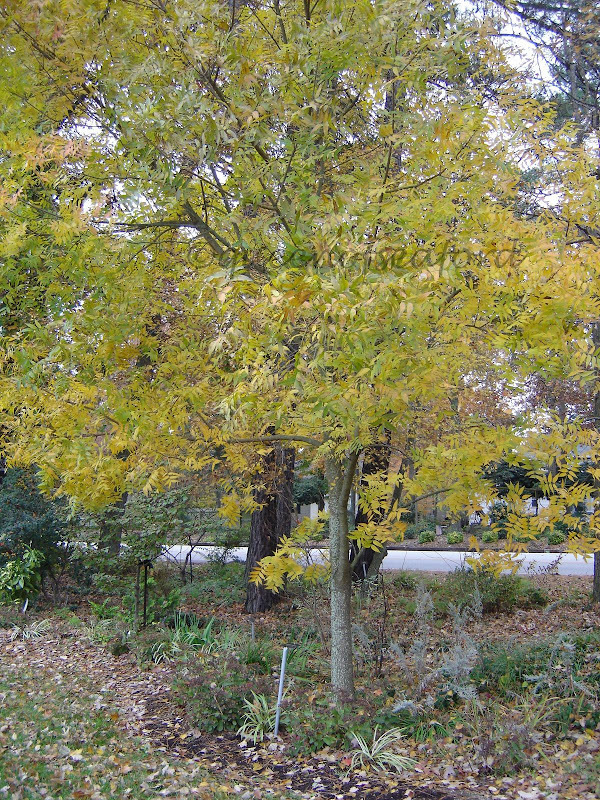 The Sassafras sprouts from roots and forms groves, crowding out other trees. 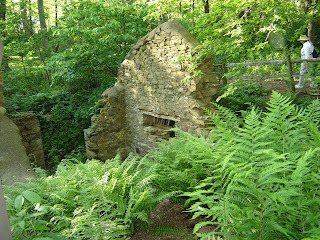 There is an allopathic feature that keeps the grove clear of other plant material. 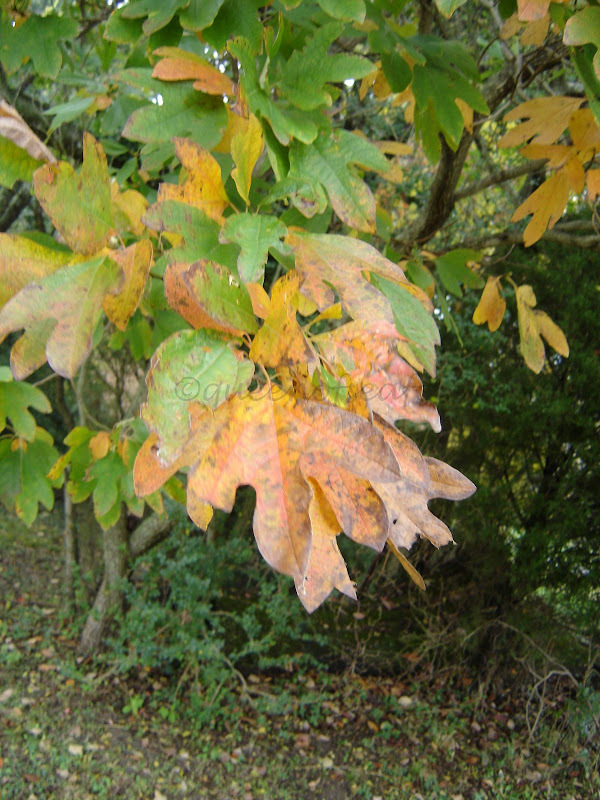 It is a dioecious tree and the seed production begins on mature (10 years old) trees and it can live up to 150 years. 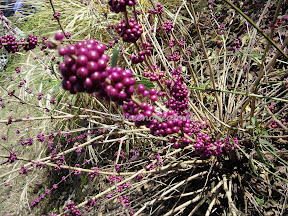 The seeds mature in one year. 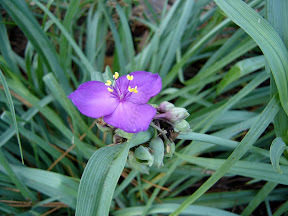 Flowers appear in early spring and are quite showy. 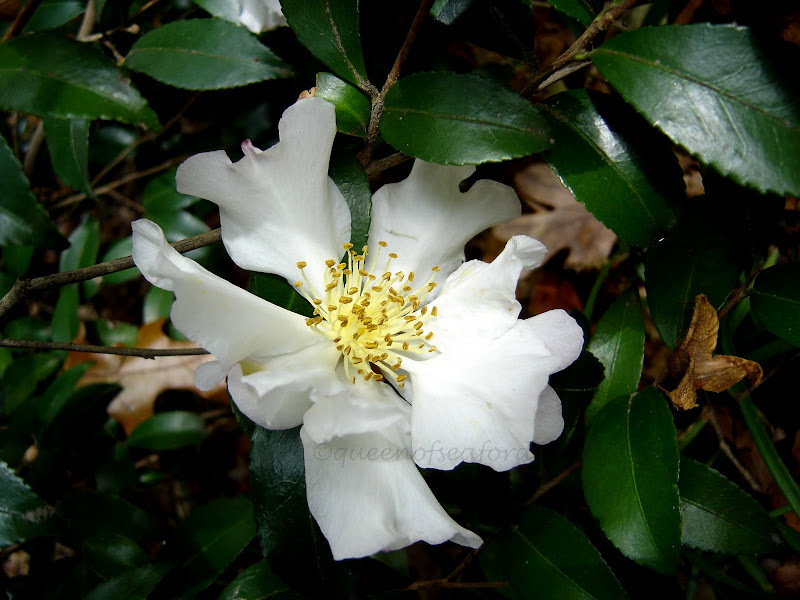 This member of the Laurel family will grow to a height of 50 feet; it is a fast grower and has softwood. Deer like the twigs in the winter and the drupes/berries are a good food source for birds. The fall color is a glorious range of yellow to orange to reds. The inner bark is cinnamon in color and outer bark has kind of twisted deep ridges. 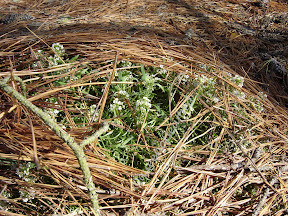 The growth pattern is irregular, twisting a bit and the twigs form a 60 degree angle with main stem. Remember all photos can be clicked on to enlarge. 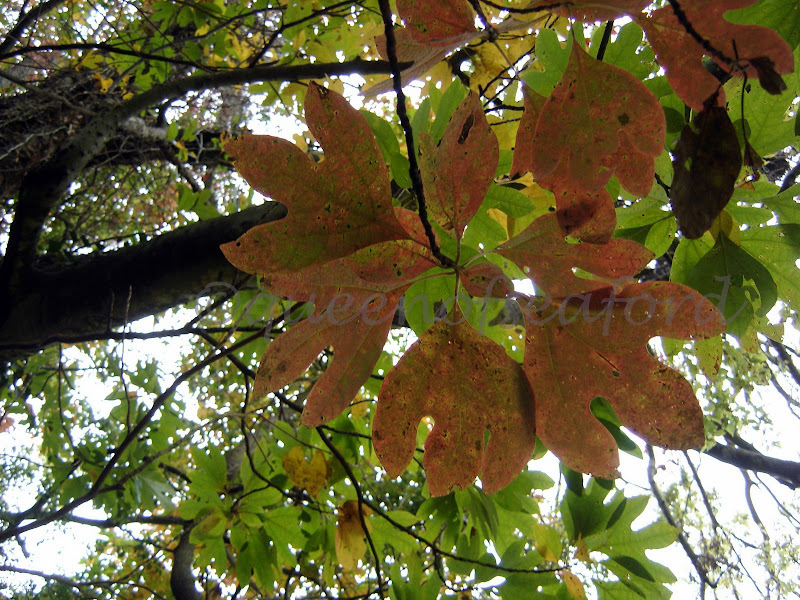 I am continuing to update previous tree posts with photos of fall color. Have you ever taken some photos that you just sit back and admire? Did I do this? 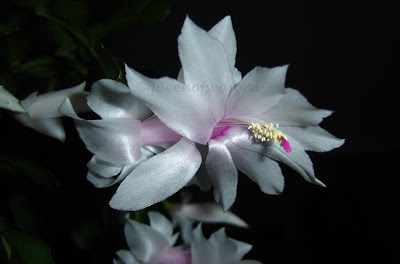 While moving things back to where they belong after our storm I was surprised to see how many blooms had opened on my Thanksgiving/Christmas Cactus. I will have to do some more research to figure out which this one is. In the meanwhile..... I am sorry, I couldn't decide which to post so here are four of the shots. 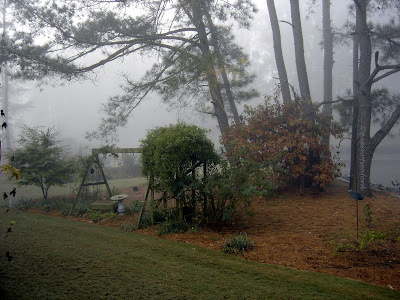 As for my garden, while I feel like it is toast, there are still some blooms-- it is just sooooooooo soggy. My August Beauty Gardenia and the Adonis Blue Buddleia have been uprooted by the wind. Will have to see what I can do after the ground dries a bit more. As for the rest of the garden, here is a sample of what is still blooming in spite of the storm. 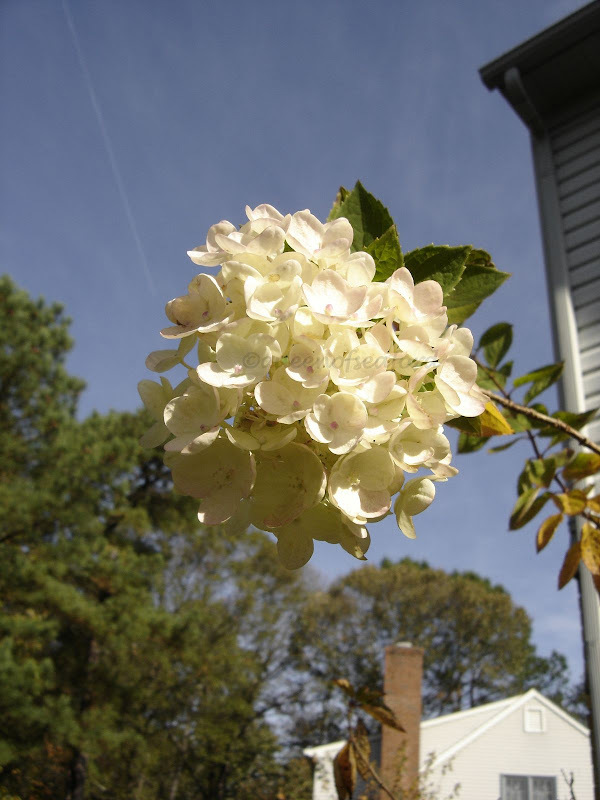 And last but not least--- the sun shining behind the Hydrangea paniculata. 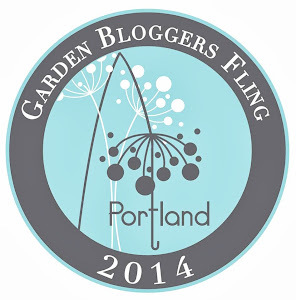 Don't forget to go to Carol's webpage to see other Garden Bloggers' Blooms. This is the window from which I most often look. If you notice there is a lot of water. We have been playing with what we are calling Nor'Ida. Take one serious nor'easter and add a healthy dose of the remains of a late season hurricane.....include over 10 inches of rain over three days and six tidal cycles. I was going to call this posting 'Where in the Hell is Pat Robertson?' He claimed to pray away hurricanes. Sorry, my sense of humor is shot. 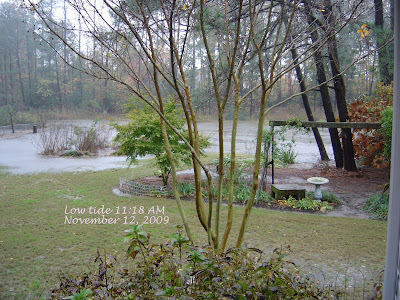 High tides got progressively higher with each cycle as the high winds would not allow the waters to recede during low tide. 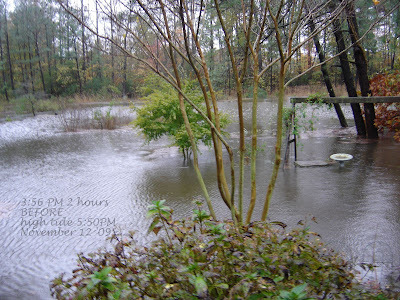 Les from A Tidewater Gardener mentioned flooding in his posting on Thursday. Wednesday we had rain and there was some talk of some coastal flooding. Ok, we could deal with that. 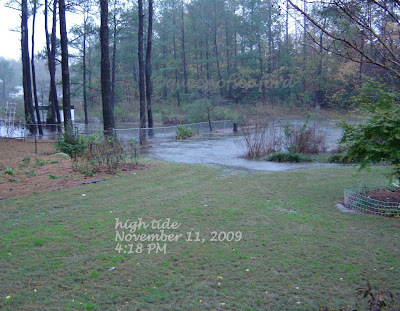 This photo is a very high tide, not uncommon with a nor'easter....higher than usual, not enough to make me crazy. We spent Wednesday putting things up, away from possible flood water. Kitchen counters and tables were covered with items pulled from any low cabinet or shelf. The garage items were moved as well. This is what happened two hours later at high tide. Again, not what I wanted to see, but oh well. Coastal flooding. 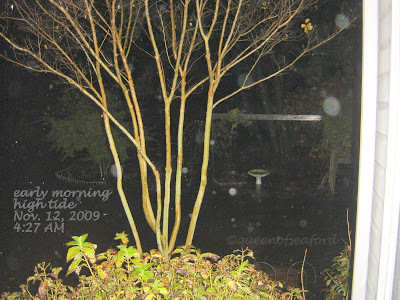 We got up very early on Thursday morning to find a lot of water in the yard. Six hours later would be our low tide. LOW tide it wasn't . 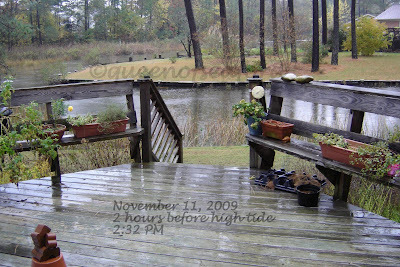 This was before high tide, I was looking out all my windows. Just how high would it come? 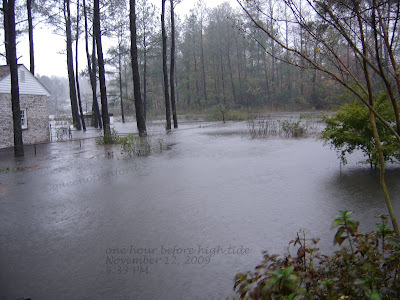 We flooded with Hurricane Isabel, something I really did not want to experience again. Before we go any further, I know there are those who experienced much worse with many other hurricanes. Mine is not a severe case, it is my case. 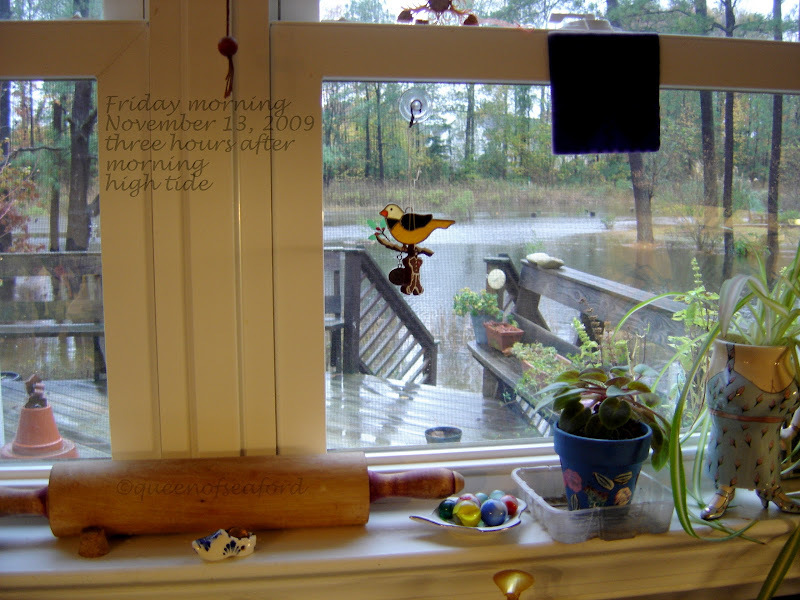 Our house got repaired and with each passing hurricane season we worried, looked out the window and watched the water. With retirement looming, we decided to build on a newly purchased lot, as those who read this blog know. 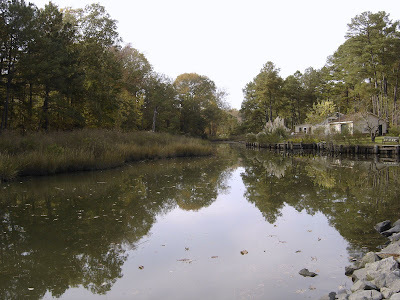 Thursday evening's water was to be worse that that morning's high tide. We paced and paced. You want to do something but there is nothing you can do to stop the water. The high tide this morning was higher than yesterday morning, but lower than last night. Hooray! The offshore winds had diminished and the water was able to recede with low tide. 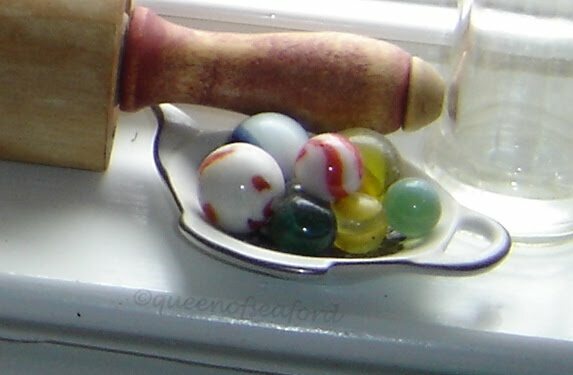 So all this being said, I haven't lost my marbles, but we do have a lot of cleanup to do. 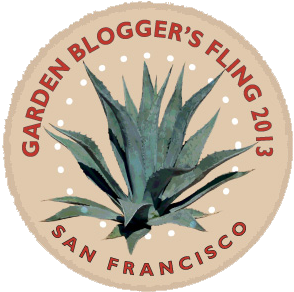 Will try to get around to other blogs in a few days. For now I am going to bed and get some rest, knowing that the worst is over. And that is my 2 cents. What Color is on Your Deck?